I have to admit, going to Harlem Food Bar was not my idea. Though I have walked by it many times and thought that the atmosphere and the outdoor patio were fun and inviting, I’m not the type to pick a burger/salad joint, ever. However, since my dinner companions were two boys whose tolerances for the unfamiliar increased in direct proportion to how loudly their stomachs are growling, my recommendation for Senegalese on Lenox was quickly vetoed, and we went to Harlem Food Bar for reliable American Burger/Bar food. 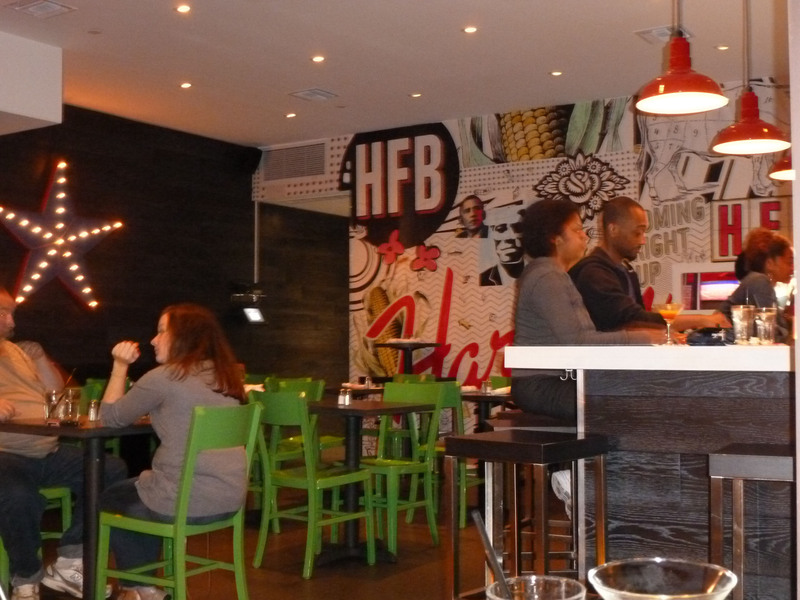 Unlike most of the sit down restaurants on Fredrick Douglas Blvd, if you go to Harlem Food Bar for dinner, you are almost guaranteed to be able to order anything off the menu. that fits into the Cheap Eats formula for Happiness (entrée and appetizer or dessert for less than $25/person). In a neighborhood notorious for slow service and aloof waitstaff (yes, Red Rooster, you know you perpetrate this crime against all of your patrons daily) our waiter was very welcoming, knowledgeable, and attentive (in all my years of sitting opposite Keith while he eats a burger and fries I have never seen any waiter replenish his ketchup supply three times, without being asked). Though most of their menu items risked being too ordinary, their quirky and bright décor (I loved their chairs, their bar set-up, and the ‘pop art’ inspired collage on the back wall), and a few of their less standard food and drink offerings provide just enough edge to make the experience memorable and their food slightly elevated from your typical Burger Joint fare. 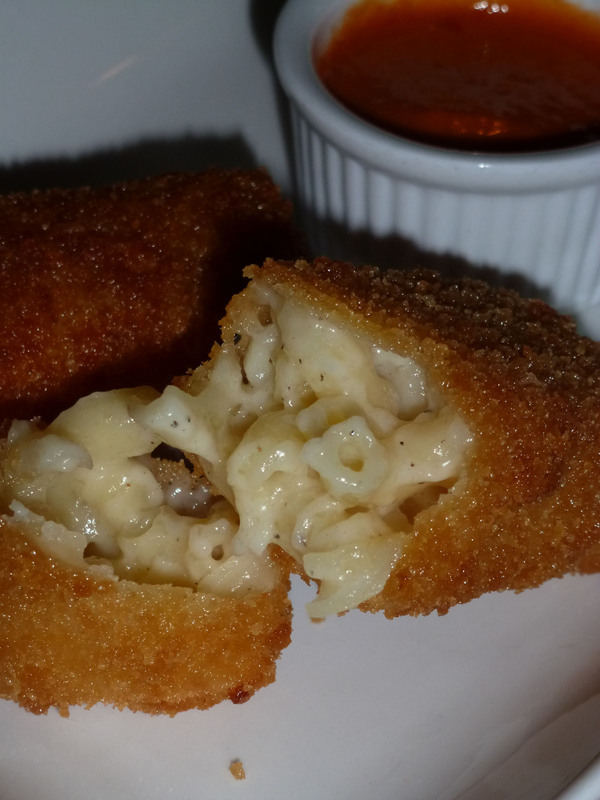 We ordered the Mac & Cheese Squares as our appetizer, against the recommendation of our waiter. He admitted that the Mac & Cheese Squares were above average, but that the best appetizer was the hummus with pita chips. Our server was right; though their coating was crisp and the presentation pretty, the cheesiness wasn’t as intense as we would have liked, which, indeed, made them only average. The dipping sauce was smooth and mellow and tasted mostly of pureed red peppers, but lacked that spicy kick I was expecting from the menu description. 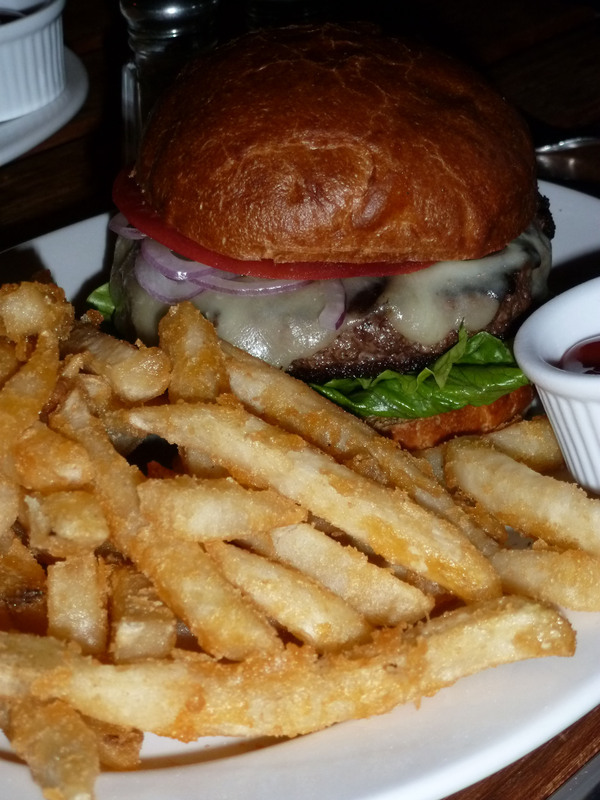 Ever convinced that the measure of a restaurant is how well they cook their burgers, Keith went with the HFB Burger smothered in melted cheddar cheese with (what appeared to be breaded) french fries. The burger was cooked to his medium well liking and was served on a brioche bun that did not disintegrate under the immense pressure of the weighty burger. The thick cut breaded fries, (though I am fairly certain were out of a freezer bag), were much better than the standard frozen skinny fries way too many (even nicer) restaurants in Harlem are guilty of serving. The onions, greens, and tomato on the burger we crisp and fresh, which, in Keith’s opinion, made the burger worth ordering again. 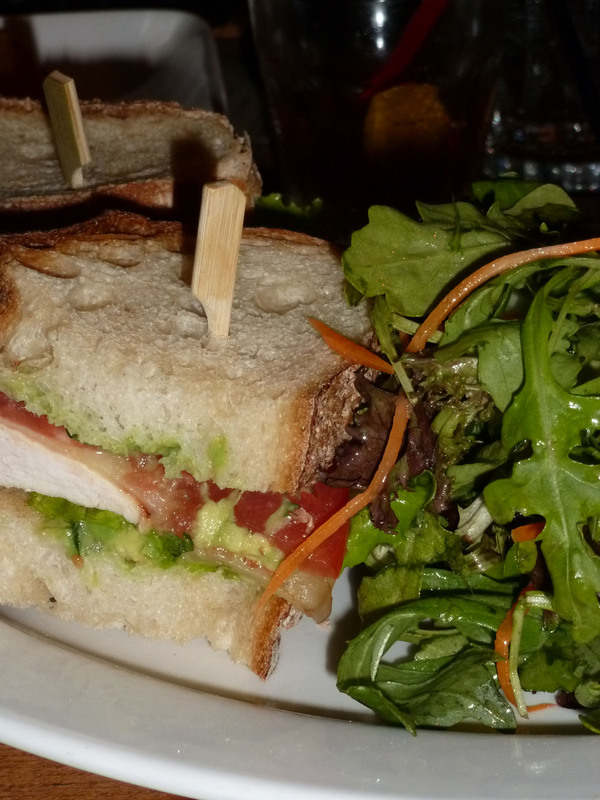 Craving protein and vegetables, I ordered the Grilled Chicken Sandwich with greens on the side. The chicken breast was both moist and flavorful, and well complemented by the avocado spread that was fresh (no unappetizing oxidized avocados here!) and creamy, while the market greens (much of which were arugula—my favorite and one of the most delicate salad greens) were very lightly dressed and crunchy. Our third diner, Phil, one of Keith’s oldest friends, ordered the steak sandwich that also came with breaded thick cut fires. Phil enjoyed his plate, though his only lament was that the combination lacked the crunch and texture from fresh greens or raw onion that one might welcome on such a heavy sandwich. 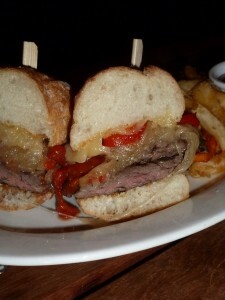 His steak was slightly over cooked, but was still tender and juicy, and he said that the peperonata (which actually looked more like roasted red peppers) added a nice lightened the sandwich a bit. We ordered polenta fries to share, and though they came out with the same low-impact red pepper sauce served with the mac & cheese squares, the polenta fries were very good. 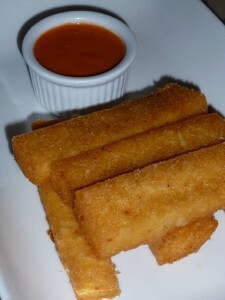 Fried crisp and sturdy on the outside, the inside was hot and creamy polenta with a subtle corn meal flavor. 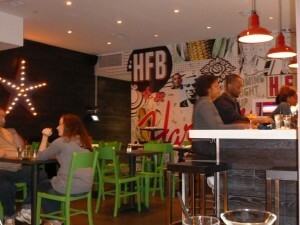 I was pleasantly surprised by our dining experience at Harlem Food Bar. Because their menu resembles everyone’s standard Lunch spot in Midtown, the food risked being boring and pedestrian. But, due to a few unique menu offerings (polenta fries, roasted corn with coconut, hummus and pita chips), well executed plates and presentation, and a strong server staff, Harlem Food Bar is a great place to chow if you have a hankering for a burger and a chill atmosphere when you’re in Central Harlem. Clearly interested in attracting the younger Harlem crowd through their image and price points, Harlem Food Bar goes the extra mile by offering a daily Happy Hour (from 5pm to 8pm) with $5 drinks and appetizers, as well as providing a forum to engage with other patrons regarding national and local politics, as well as benefiting local charities with a portion of their profits on certain days of the week. This entry was posted by Arionna on Thursday, October 18th, 2012 at 7:42 am	and is filed under Bar/Pub, Harlem, Manhattan. You can follow any responses to this entry through the RSS 2.0 feed. You can leave a response, or trackback from your own site.